WINTER IS SETTING IN, BUT SPRING AND SUMMER WILL FOLLOW. DREAM OF WARM SUN, TOES IN THE SAND, FORGET THE COLD. CHECK AVAILABILITY NOW FOR SPRING AND BEYOND!!! A friend named our "little piece of Heaven" after a relaxing vacation at our Beachfront Townhome, and we couldn't agree more. The sense of peace and relaxation that is just a natural part of the area highlights the feeling of being truly on vacation. Stroll along the white sand beach, let the warm Gulf water tickle your toes and breathe easy. You may see dolphins frolicking just off shore, or pelicans and gulls swooping overhead. Relax on deck in the evening and watch a gorgeous sunset. Fall asleep to the sound of waves breaking on the shore. This is why you came to the beach! You can enjoy all this is our comfortable, well appointed beach townhome. The living/dining area is nicely furnished, featuring a cozy setting complete with HD TV for your entertainment. The kitchen offers everything you need for meal preparation, everything! Or go out to try one of the many, many great restaurants located in the towns along 30A; any cuisine you like, or want to try, is out there. You'll find everything from fine dining to casual fare to sidewalk Airstream food trucks - and it's all good! All sorts of activities are available in this area: biking, fishing, kayaking, paddleboarding, exploring nature trails, golf, shopping, sightseeing. You can be as busy, or lazy, as you like. Then after your choice of an active or relaxed day, sleep soundly dreaming of tomorrow. The house has two bedrooms and sleeps six; two full and one half bath. There are HD TVs in each bedroom. There is a large deck off the living room and a balcony off the master bedroom. A carport below the house features a laundry room with full size washer and dryer for use by this unit only. In the laundry room you will find beach chairs, umbrellas and beach toys. Bed linens, bath and kitchen towels are provided. Just bring your beach towels. So start packing!! After searching through many beach towns on the East Coast, we came to Seagrove Beach and fell in love with the sugar white sand and emerald green water. We just knew this was the place where we wanted to have a beach house. After growing up spending vacations playing in the rough Atlantic Ocean, we now are faithful fans of the beautiful Gulf of Mexico with its many moods and sparkling emerald colored water! This townhome offered everything we needed in terms of space, comfort and location. The beach here was one of the most beautiful we had ever seen, and we still feel that way years later! To be able to see the beach and Gulf from the living, dining, kitchen, and master bedroom is a plus. We never tire of that amazing view and the big, wide deck from the living room and balcony from master bedroom are both great places to take in the beauty. Never having to drive to the beach, just walk to the access path near the eastern end of our complex just can't be beat! We have the softest, prettiest, white sugar sand you've ever seen! Walton County has rare coastal dune lakes, a feature with lakes and the Gulf interacting and creating a special and unique ecology. We can see a lake from our kitchen window. You will see the beach and Gulf from the living room, dining area, kitchen, master bedroom, deck and balcony! We have an obstructed view of the beach, Gulf and all the gorgeous sunsets! From the kitchen window there is a view of Little Deer Lake. Sheets, bath towels and kitchen towels provided. Laundry room off carport offers full size washer. Full size dryer in laundry room. 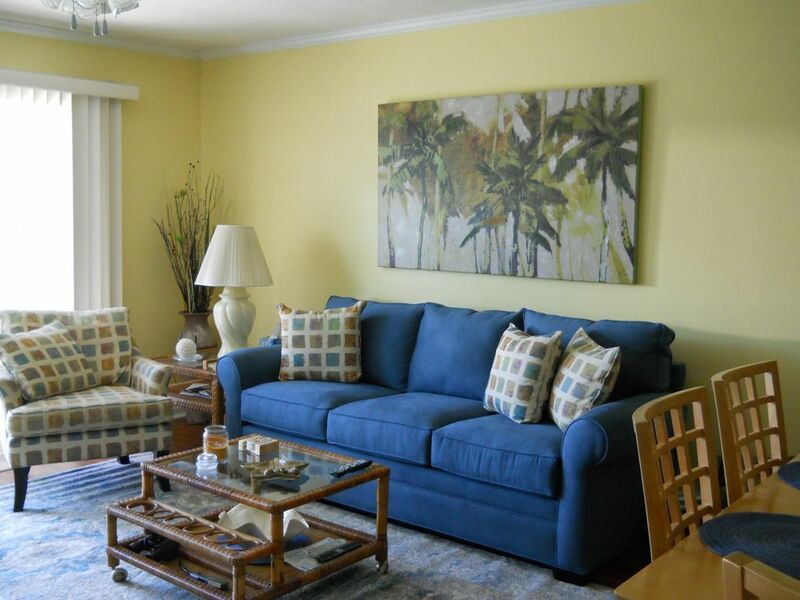 Comfortable upholstered sofa, two chairs, TV, large windows and sliding door to deck, great view of the beach and Gulf. Electric, 4 burner glass top model with vent hood with light and fan. Ample supply of dishes, glassware, flatware. Roomy dining table with seating for 6. (3) large flat screen, HD television with DVR and 45 music channels. Cable TV on flat screen TVs in both master and guest bedrooms. Help yourself to selections from the bookcase in master bedroom. Lots of sand toys for the little ones, swim noodles and boogie boards stored in the laundry room. Kayak, standing paddle boards, are available for rental and delivery. Bicycle rentals available from many sources and they will deliver. Large dining table seats six, Playmate Cooler (9 can size), Picnic Table, Grills, Outside Shower, Beach chairs, umbrellas, toys available. Very nice condo. Good location central to everything on 30-A. Great view of the Gulf from the back deck and only short walk to the shore. Exactly as this stated, our beach house is perfectly situated for easy access to all the marvelous things to enjoy along 30A! If you are not familiar with 30A, you must come sometime. You will love it! What a lovely review, and so appreciated! These guests claimed to have had a "magical week" during their first visit to 30A. It is a special place and yes, the people, the food, the shops all help make it that way. All who experience this beautiful beach strive to return again and again! It really is a little piece of heaven ! Location, location, location! Peggy’s place is so perfect and right on the beach. She has everything you need for a day at the beach as well as all the comforts of home in the townhouse. We loved fixing breakfast and relaxing each morning on the patio with such an amazing view of the ocean. We also loved the fact that the beach and ocean are literally right in front of you. Each morning we would grab a few of the beach chairs Peggy provides, and go claim a spot on the beach. Then walk back to the townhome to fix breakfast before our day by the ocean. Peggy is a great host, very responsive and answered all of our questions so quickly. We had a wonderful, relaxing week here and cannot wait to come back. We feel so fortunate to have the pleasure of dealing with such pleasant vacationers who enjoy Seagrove Beach as much as we do. It is definitely a special place so filled with natural beauty! Folks find it easy to completely relax and revel in the beauty of the beach and the comfort of the house and deck. Nice location, loved the view from the decks. The available grills are shared charcoal grills in the parking lot and laundry is outside of the townhouse in room off the parking area under the unit. I would choose this townhouse again for future visits. So true, you can't beat the view from our decks! Whether enjoying coffee in the morning or wine in the evening, it is a beautiful and mesmerizing sight! Easy going review for an easy going beachtown! Yes, the location is perfect and access to the beach is truly just steps away. Of course, the view of the beach and the beautiful Gulf of Mexico is spectacular! Short, sweet, and to the point! Yes, Seagrove Beach is beautiful, a location to be thoroughly enjoyed. We are happy this guest, who was trying a new part of Florida, found it so perfect. And we always do our best to make the accommodations we offer live up to the promise made! Service fee shown under price details is imposed by Home Away. The owner has no control over this fee when bookings are made through the HA or VRBO system and that fee goes to Home Away, not to owner. The owner asks a $300 deposit to cover damage protection for owner and to also hold your reservation. Full payment of rent, cleaning fee, and tax is due 15 days prior to check-in. 50% refund of deposit 60 to 46 days prior to arrival date; 45 days out and on no refund of deposit. Owner NEVER expects full payment at time of booking. Deposit will be refunded after inspection of property following your departure if property in good condition. You can expect to receive your refund PROMPTLY! Our bookings run Sat. to Sat. in Spring, Summer and Late Summer. Check in time is 4pm, check out is 10am.